Squirrels Unlimited isn't a support group for squirrel lovers, or a source of all things squirrels, it's a hunting club. 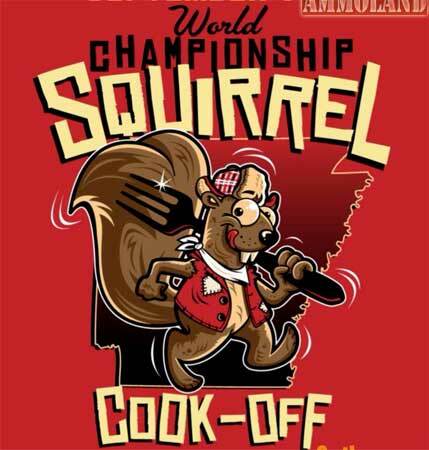 They just announced the details for September's Squirrel Cook-Off. In case you need some time to perfect your recipes, you can read more here. 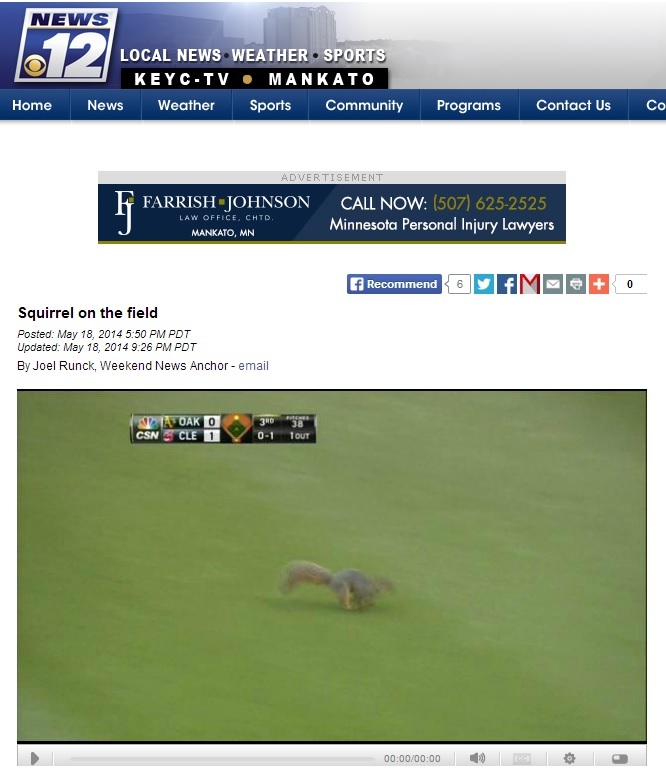 In the same game that A's pitcher Scott Kasmir got kicked out in the second inning (I only care because he's on my fantasy baseball team), a squirrel caused a delay in the third inning. The squirrel seemed to want to play shortstop, where he hung out for several seconds before the stadium played the sound of dogs barking over the PA, which sent him running into the stands. Watch a video here. Fire fighters in Ann Arbor recently rescued a baby squirrel who was a fire victim. After resuscitating the little guy, he was reunited with his mom. Watch a video here. Apparently a fire in Kansas was started by a squirrel who had somehow ignited. No information how the squirrel caught on fire, I'm going with "firestarter" superpowers. Turns out drunk driving is a bad idea. Drunk driving + swerving to avoid a squirrel = crashing your car. Luckily this woman wasn't injured when she veered to avoid hitting a squirrel, driving her truck off a bridge and into a creek bed. Malone University squirrels, like most squirrels, are local celebrities. Perhaps the students love them because they cause more trouble than freshmen, eating cables, shorting out wires and blowing out transformers. You can follow the squirrels on Twitter at @MaloneSquirrels. In an apparent echo of Berkeley, CA's recent furor over ground squirrels, San Jose city officials are proposing a massive cull to reduce damage the squirrels are doing to La Colina Park. My prediction: This one's not going down without a fight. A squirrel caused a power outage in Tempe, AZ, after it crawled into an electrical feeder. Best quote ever: "It's unfortunate, but we're sad for the squirrel," said APS spokersperson, Jordan Karem." Read about it here. A squirrel jumped into a public pool in Torquay, a town in Devon, England, causing a bit of a stir. A man grabbed the squirrel and brought him to safety at the poolside. How did the squirrel repay the favor? By biting him. 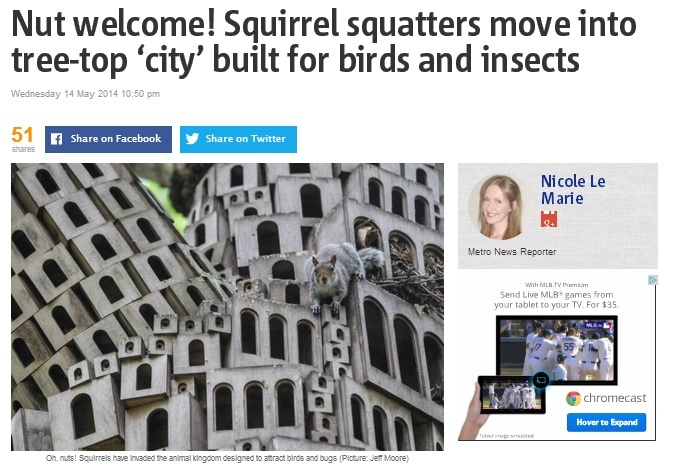 Artists in the UK built a "palace" of nest boxes for birds, which squirrels promptly took over. Is anyone surprised? Posted in squirrels. Tags: baseball, birdhouses, car accidents, hunting, power outages, squirrels on May 19, 2014 by Mikel Delgado.